I’ve mentioned before how much I love blazers. They’re one of those pieces of your wardrobe that can be used with pants, shorts, skirts, casually, formally- any way you want, truly. 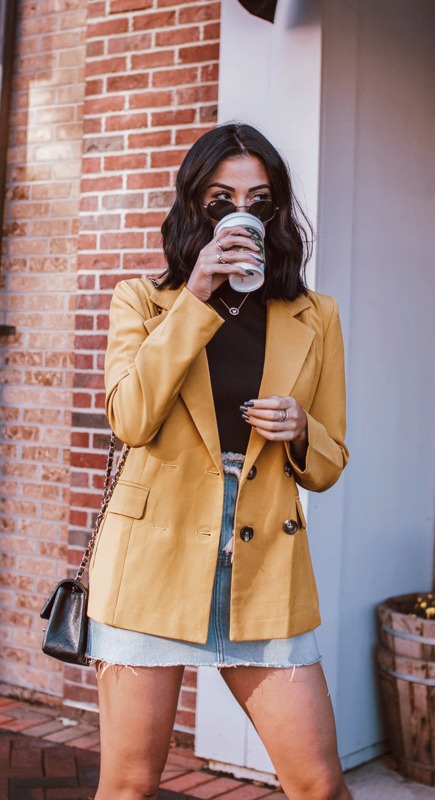 So here you see this yellow blazer from Nasty Gal. I love it. Yellow is a color that is mistreated, not worn enough, but it never fails. Beneath the yellow blazer, a black turtle neck from H&M. Another item so often misunderstood, but they’re fabulous, and your closet needs one. You may have seen this Dimy skirt in another one of my other OOTD’s. It’s such a fun skirt because of the oversized grommets that the rope belt laces through. It provides the character to the solid jacket, solid shirt, and the denim skirt. Also, always fashionable to pull a skirt with long sleeves during fall! Wearing Chanel shoes with black toes and a black Chanel bag. Little black accents are full circle with the top. Don’t be afraid to bring the color down and around!